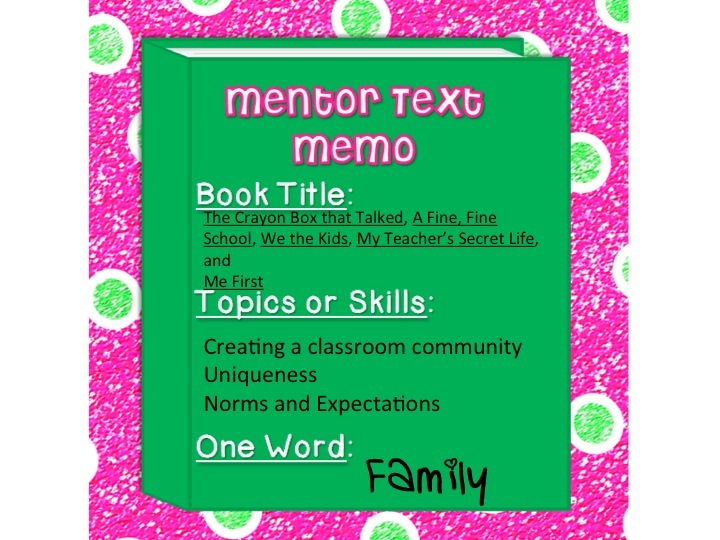 Back to school mentor texts, how fun is this? Whew...so glad that Stacia posted several! There was no way I was going to be able to post about just one. Here is my first week of school! 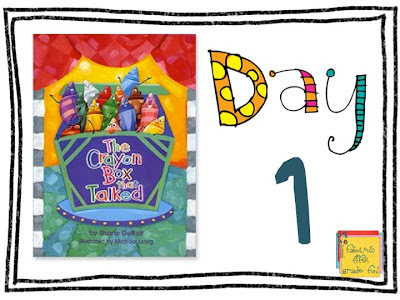 I start the school year by reading the book, The Crayon Box That Talked. The book is about the importance of everyone’s different talents and how we are each unique and creative, but when we work together, the end result is a spectacular picture. We each use our new box of crayons and, together, create a class mural. Somewhere on that mural, each student writes how they are unique. Those waxy rainbows come together to create a fanciful picture, bringing us together as 25 creative members of our own unique crayon box. This is just the beginning of building a class community. This book is adorable! It is about a principal that is so very proud of his school that he thinks that school needs to be on Saturday and Sunday and holidays because it is such a Fine, Fine School! 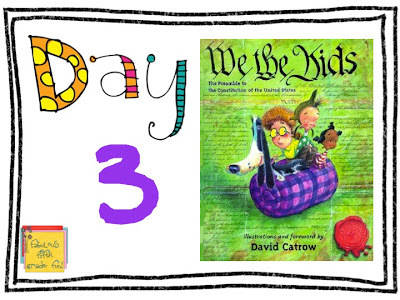 I love reading it because it is one of those books where the students start to chime in to help you finish the line! After I read this book, I have my student brainstorm a Fine, Fine Classroom! What does it look like, sound like, and feel like? In a fun and kid friendly way, David Catrow, writes about the Preamble to the Constitution. You have seen several teachers write their own "Class Constitution" and then have all the kids sign it, I on the other hand, have switched to writing our "Classroom Norms." These are based off of what a fine, fine classroom looks like, sounds like and feels like. I write it on a big piece of paper and we post it in our class. (I'm heading to class today so I'll try to take a pic of it.) I refer to it when I feel a student might need a reminder about what we decided makes a fine, fine classroom! My Teacher's Secret Life is part of creating the class community and getting to know each other. After I read this book. 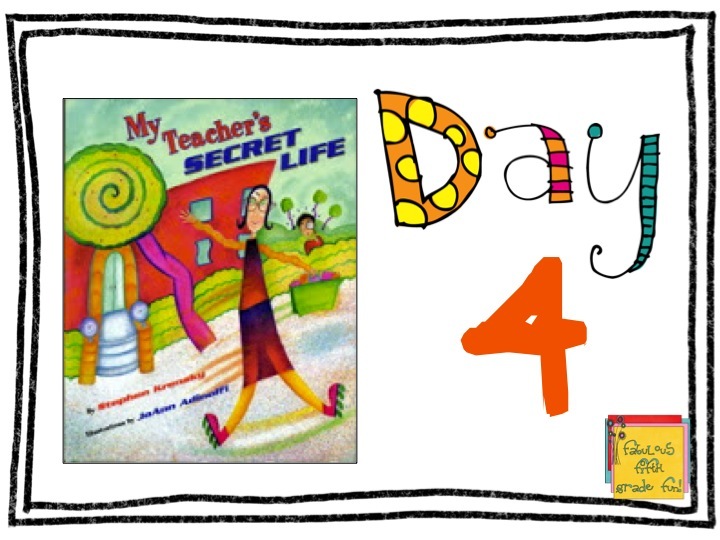 I read them, The Not So Secret Life of Mrs. Dolat! I create my book using the website, Stapleless Book, by Read-Write-Think! The site has a well planned lesson, "Getting-Acquainted Activity Using My Teacher’s Secret Life." Students use a planning sheet to write a glimpse into their life beyond school. Once, each student has typed in their information and printed, they can draw pictures to go with each page. Then, we put them in a special place where everyone can read about the...not so secret life of each person in our class. 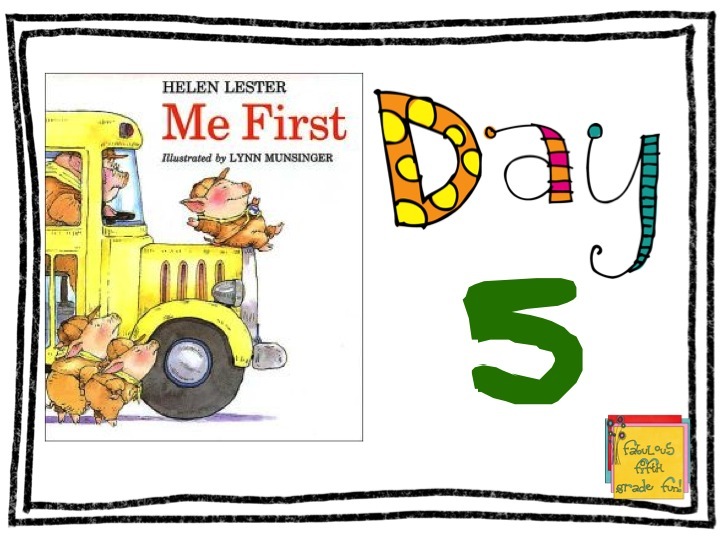 You know you have them...the kids that race to be first...first in line, first to raise their hand, first to turn in their work, first to blurt out the answer...and the list goes on! This hysterical book allows you to bring out your best witchy voice as you read, "Who wants a sandwich? "and watch Pinkerton Pig race to be the first one to get a sandwich...only it's a sand witch! Let's just say...Pinkerton learns a lesson! Love this book! This flows into a reminder about...if you happen to be first to finish your work, be sure to follow the directions on this sign! Ok...no matter when you finish...be sure to follow the directions on the sign! 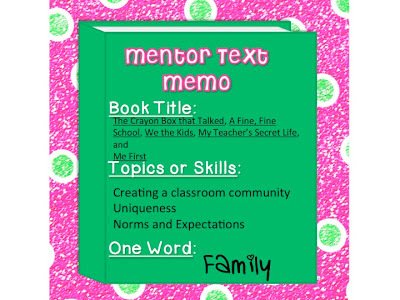 I could go on and on with the number of books that I use the first few weeks of school...but I will stop at this point and wait until the next mentor text linky! I know...you've probably heard it enough...If you haven't, please click on the link to follow me on Bloglovin'! Join Collaboration Cuties for this fabulous linky. I can't wait to see what other books are used for back to school. Have a wonderful Sunday! I'm off to school to do some more packing. Thanks! I have several other books I love to use except I can hear the voice of one of my dear friends.."Top 5 only! After that it's too overwhelming!" I hadn't heard of The Crayon Box that Talked- what a great message! I think I'll need to pick that one up! It is such a wonderful story. I've seen several cute bulletin boards related to this story! Great first day activity! I love your book choices and especially like the activity that goes along with book choice one. Do you have a picture of the mural your students made? This is a great list! I'm unfamiliar with several of these titles, so I'll definitely have to check them out. Thanks for sharing! Glad you like them! Many of my favorites...of course my students will say that I say that all the time about every book I read them! Heading over to your blog! I just got a new position as Instructional Tech Specialist so excited to see your blog! 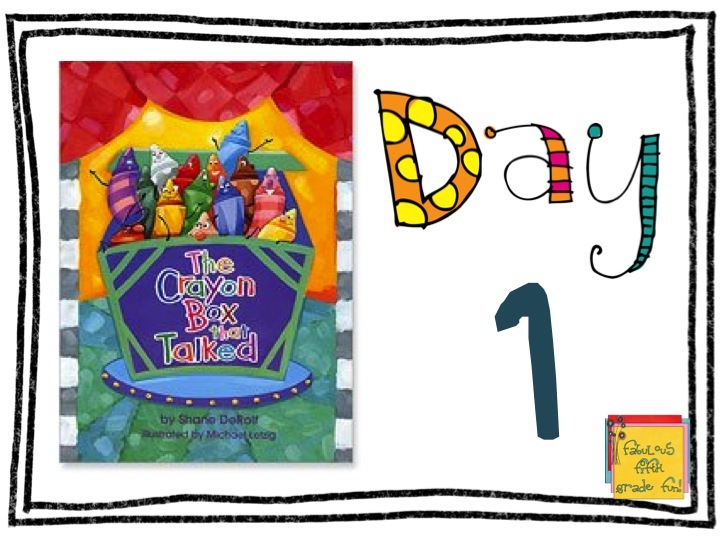 I just added The Crayon Box that Talked to my wishlist-it sounds fantastic! I love using My Teacher's Secret life during Writing Workshop. Such a great list of books, thanks! 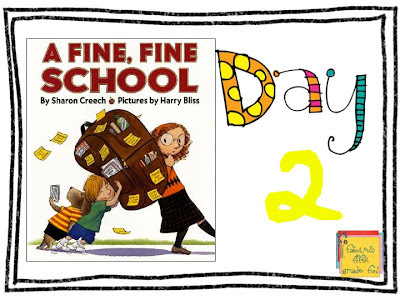 The only book here that I've heard of is Fine Fine School! I'm so glad you linked up so many new, cute, fun books!!! I love the crayon box idea! How cute! I'm going to do that this year! I already have so many books I love for the first week I don't know how I am going to find time to get all of these books in, but you better believe I will try!! Great book suggestions! 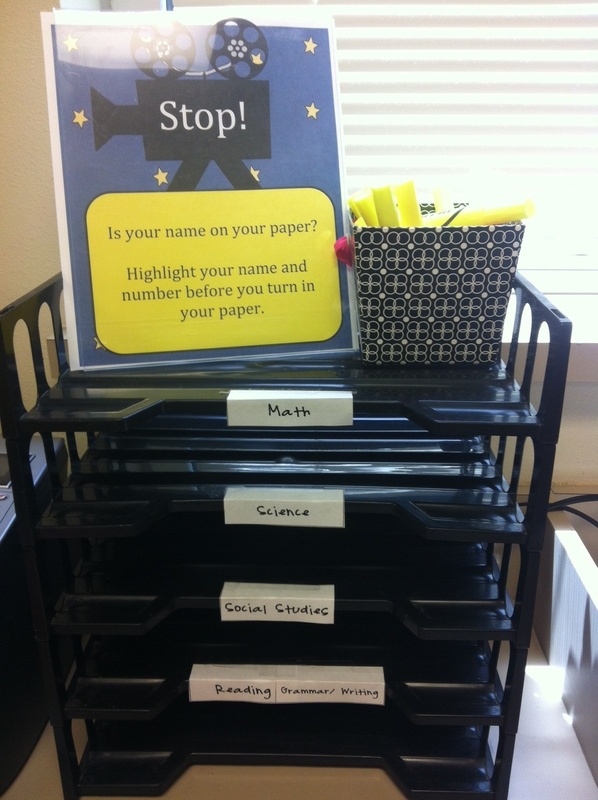 I also like your name an number on paper sign/highlighting idea. Thanks so much for sharing! 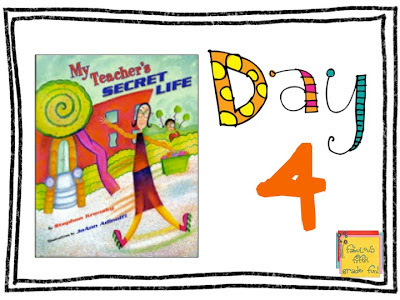 Crayon Box That Talked is new and I appreciate the link for The Teacher's Secret Life! Thanks for sharing! I love adding new titles to my collection! 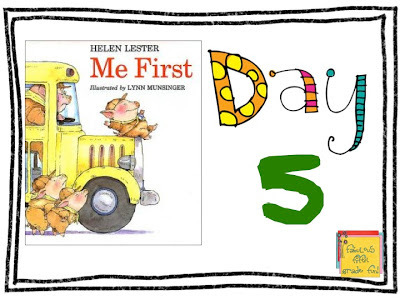 I had to add "Me First" to my pin list because that reminds of some of students and, I'm afraid to say, my daughter!! She has to be first for everything! I hope someday it serves her well:) Thanks for sharing all the wonderful books!